The Low Carb Grocery got creative for a Low Carb QUESADILLA! We tried using as much in-store products as we can but adding green onion and shredded mozzarella REALLY makes it taste great! This recipe has a bit of a kick so you are warned! But please keep in mind there are other flavour options if you are not good with the spicyness. Bake in oven 5 mins. Optional: Serve with Desert Pepper Tequila Salsa (1/2 tsp) (2.7 calories, 0.25 carbs). to a perfect meal. Homemade desserts can be easy and time consuming. But this simple homemade dessert can be prepared in less than one hour. 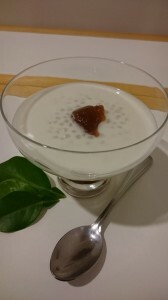 While traditional dessert uses tapioca pearls or sago as its base, we made this delightful dessert a dream come true for all who live the low carb lifestyle. In a separate pot, bring ½ cup of water to boil and mix in 1/3 cup of Swerve granular sugar until fully dissolved. 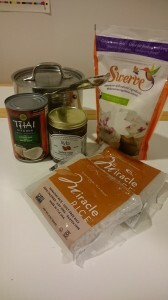 Turn off the heat, pour 1 cup of Thai Kitchen Organic Lite Coconut Milk and miracle rice into the dissolved sweetened water. 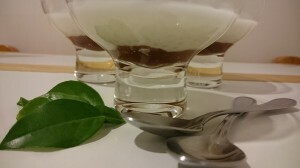 Optional: for strawberry add 1 tablespoon of Xyla Strawberry Jam per serving of sago soup.